This article is about the original 1997 game. For the entire series, see Dungeon Keeper (series). Dungeon Keeper is a strategy video game developed by Bullfrog Productions and released by Electronic Arts in June 1997 for DOS and Windows 95. In Dungeon Keeper, the player builds and manages a dungeon, protecting it from invading 'hero' characters intent on stealing accumulated treasures, killing monsters, and ultimately the player's demise. The ultimate goal is to conquer the world by destroying the heroic forces and rival dungeon keepers in each realm. A character known as the Avatar (resembling the Avatar from Ultima VIII: Pagan) appears as the final hero. Dungeon Keeper uses Creative Technology's SoundFont technology to enhance its atmosphere. Multiplayer with up to four players is supported using a modem, or over a local network. Dungeon Keeper took over two years to develop, and an expansion pack, a Direct3D version, and a level editor were released. Midway through development, Molyneux decided to leave Bullfrog when the game was complete, which was the motivation for its success. A Sega Saturn version was in development, but cancelled. The game received critical acclaim, with reviewers praising the uniqueness and depth. Dungeon Keeper was re-released on gog.com in 2011, and on Origin in 2016. A fan-made mod, KeeperFX, was released, which fixes bugs and adds features. Dungeon Keeper was followed by a sequel, Dungeon Keeper 2, in 1999. The player constructs and manages a dungeon, recruiting and catering for minions to run it and defend it from enemy invaders. The primary method of control is the hand, used to pick up creatures and objects in the dungeon, carry them around, and drop them. The hand allows the player to 'slap' creatures and objects, and interact with them. Dungeon Keeper's gameplay exemplifies a dark sense of humour. The Dungeon Heart represents the Keeper's link to the world. If it is destroyed, the player loses. Along with the heart, the player begins with a small number of imps, the generic work force for dungeon activities: they dig tunnels into the surrounding soil, capture enemy rooms and Portals, mine gold and gems, set traps, and even attack when desperate or threatened. Imps are obtained by using the Create Imp spell. Slapping creatures forces them to work faster temporarily, but removes some of their health and happiness. Gold is obtained primarily by digging Gold Seams, and Gem Seams provide an unlimited supply, though take longer to accumulate. Gold is used to build rooms, cast spells, and train creatures. To order the imps to dig a tile, the player must flag the tile. Once the Imps are working, the player must then set up a basic infrastructure: Lairs for monsters, a Hatchery (where chickens, which serve as food, are bred), and a Treasury. After connecting the dungeon to a 'Portal', minions will arrive. Minions include dragons, warlocks, and the horned reaper, as well as undead creatures such as vampires and skeletons. As the game progresses, the player moves along a technology tree, unlocking further rooms and spells. Rooms can only be built on tiles belonging to the player. The player is red and the tiles are coloured accordingly. Other keepers have different colours, and the heroes are white. Unaligned creatures and rooms are multicoloured. The player can build traps and doors, created in the workshop. Traps include lightning and boulder traps, the latter instantly killing creatures it comes into contact with. As with rooms, they can only be built on tiles that belong to the player. Traps are not built instantly; Imps need to place them on the blueprint. The Temple is a room where creatures are made happy, and the player can sacrifice creatures to the dark gods. The gods may reward or punish the player, or be indifferent depending on the sacrifice. The dungeon has a fleshed-out ecology: certain creatures are natural enemies. For example, Flies and Spiders are often found at odds with one another. Common behaviours when a creature is angry include vandalising the dungeon and deserting the player. The creatures are varied in their statistics; some excel at certain tasks, and others refuse to perform certain tasks. Which creatures enter the dungeon depends on which rooms the player has and how large they are; most creatures have prerequisites for entering service. Creatures require paying regularly, and when 'Payday' comes, will head for the Treasure room to collect their wages. Other ways to obtain creatures include imprisoning and torturing them, 'scavenging' (persuaded to defect to the player) from enemy keepers, and performing certain sacrifices at the Temple. Creatures entering via the Portal are at the lowest experience level, and must gain experience, usually by training in the training room. Training creatures increases their attributes (such as hit points) and abilities (such as which spells they can cast). Such spells include lightning bolts, rebounding projectiles, and increasing armour. Creatures will frequently enter combat with heroes or creatures belonging to another keeper. Each creature has a star of the colour of the keeper it belongs to above it, displaying its experience level. The star is a health meter; as a creature takes damage, the spikes turn black. The player has the ability to possess a creature, seeing the dungeon from its first-person perspective and using its attacks and abilities. This is one of the spells; others include speeding creatures up, and healing them. A world map is available and, at the beginning, the player is allocated one of the twenty regions of a fictional, idyllic country to destroy. As the player progresses through these regions, each representing a level, the areas previously conquered will appear ransacked, twisted, and evil. The goals for each level are straightforward: they generally fall along the lines of eliminating the heroic force or destroying all other Dungeon Keepers. The first few levels are tutorials, teaching the player the basics. Special items are hidden throughout certain levels. Such items perform actions such as increasing the player's creatures' experience level, or revealing the map. They can reveal a hidden level, where the player must perform a specific task, and is rewarded upon completion. Heroes will appear at various points and times, sometimes accompanied by a tunneller dwarf, who, like imps, are able to dig. The dungeon can be protected from being breached by having the imps fortify the walls. Heroes include giants, wizards, and samurai warriors. Most levels have a 'Lord of the Land', a heavily armoured knight, who must be defeated. In the final level, the Avatar (resembling the Avatar from Ultima VIII), the most powerful hero, appears as the Lord of the Land, and is resurrected after being defeated. He must be defeated again when he reappears with a large army. Multiplayer with up to four players is supported via a modem or over a local area network (LAN). The game features twenty multiplayer levels, playable as single-player levels. Dungeon Keeper was developed by Bullfrog Productions under Peter Molyneux, who wrote the game design, testbed, and the computer players and assistant. In an interview, Molyneux explained that he came up with the ideas for Dungeon Keeper while sitting in a traffic jam, and become so engrossed in them that when the traffic had moved, he did not notice. Development began in November 1994 by the lead programmer, Simon Carter, and took two and a half years to develop. The game used the engine for Magic Carpet, and the first version was merely scrolling around a map and entering third-person. Molyneux then developed a 2D prototype containing features that made it into the final game. The prototype focused on constructing the dungeon, and included the Treasure room, Hatchery, Training room, and Dungeon Heart. The characters were designed by the artist, Mark Healey. The navigation system proved difficult to develop because computers of the time lacked power. Artificial intelligence was considered crucial, as the navigation and other aspects relied on it. According to co-designer Jonty Barnes, the team wanted the creatures complex without high computational costs. Healey came up with the idea of slapping creatures to make them work faster, and Barnes considered it a "great game decision". A great deal of time was spent working on the user interface, and at one point the idea of having no interface was considered. Carter stated that the team tried to make the sounds atmospheric and industrial so players got a sense of power. Using others' 3D sound routines proved troublesome, so he and his colleague Tony Cox wrote their own. Development on the level editor began in May 1995. The first-person view was developed in September 1995, and the creatures had shadows added, which was believed impossible at the time. Around that time, Barnes left the project to complete a degree at the University of East Anglia, and returned in July 1996. In November 1995, Barrie Parker began writing levels, and developed content for the script language. Bullfrog tried to get a version out for Christmas 1995: it was then the development team realised the game should focus on a living world created by the player. In February 1996, Molyneux decided to focus on the project full-time. In July 1996, Alex Peters joined the project and ported the game to Windows 95. Dungeon Keeper was shown at the European Computer Trade Show in September 1996. The final testing began in April 1997, and was signed off in June. Dungeon Keeper was released by Electronic Arts in June 1997 for Windows 95 and MS-DOS. Sega Saturn and Sony PlayStation versions were in development and due for release in 1997, but cancelled. Carter wrote and organised 800,000 lines of code. Richard Ridings provided many of the game's voice-overs. The music was composed by Russell Shaw and, according to Healey, this came late in development. The prospect of working on Dungeon Keeper motivated artist and former Bullfrog employee Gary Carr to return from The Bitmap Brothers (he had left Bullfrog because of a disagreement with Molyneux on Theme Park), but he was assigned to Theme Hospital instead. Healey produced 90 per cent of the graphics. The game as it ended up was developed mostly in the final few months: the team started again from scratch long into the development cycle because they felt it played like Command & Conquer. Most of the creatures were the team members' ideas, although Molyneux was involved with the Imps. The Horned Reaper was one of the artists' ideas, and ultimately become the game's mascot. Molyneux was impressed with the creature's navigation code: he stated that it is the largest piece of code, and that players could change the map repeatedly and creatures will still find routes to their destinations. Molyneux also liked the fact that the game adapts to the player, enabling the choice of the preferred methods and strategies, and stated that his favourite part of the game is how the player digs out rather than build up, meaning the player has heavy involvement in building the level. He stated that he was proud of Dungeon Keeper's concept, but remarked that doing original things takes time. He also liked that people were unable to describe Dungeon Keeper in any particular way. Molyneux disliked the user interface, saying the team overdid the control panel, and commented that it was a reminder that the player was playing a video game. This was a key reason the user interface of his next video game, Black & White, did not feature panels, buttons, or icons. 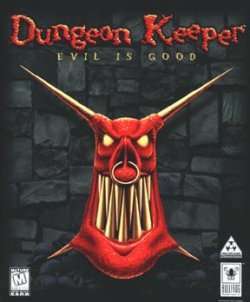 Dungeon Keeper was Molyneux's final project with Bullfrog before he left in August 1997 to form Lionhead Studios, and after completion, he stated that he wanted to make "the coolest game ever". Molyneux decided to leave Bullfrog in July 1996 due to frustration over corporate meetings and other management responsibilities that ensued after it was sold to Electronic Arts in 1995. He intended to leave as soon as Dungeon Keeper was complete, and his departure was one reason he wanted to make the game good. As a result of Molyneux's decision, Electronic Arts asked him to leave its offices, but Molyneux wanted to continue development, so the team moved into his house. The game uses SoundFonts to provide additional ambient sound effects. A Sound Blaster AWE32 or AWE64 is required to use this feature. The player can load a SoundFont and use it for ambient sound effects. Customised SoundFonts can be created to personalise the dungeon. The game features three SoundFonts, one of which is loaded at game startup, and Creative offered sample Dungeon Keeper SoundFonts for download. An expansion pack, The Deeper Dungeons, was released on 30 November 1997. It features fifteen new levels each for single player and multiplayer, and an improved artificial intelligence for the enemies. The Avatar also reappears in the final level. A Direct3D version, which brought improved graphics and 3D acceleration support, and a level editor were released for the game. These add-ons, along with the Deeper Dungeons and a Dungeon Keeper-based desktop theme, were bundled with the game, re-released as Dungeon Keeper Gold Edition on 31 December 1998. Dungeon Keeper received a fan-made mod, called KeeperFX. This mod increases compatibility with later versions of Windows, fixes bugs, and adds features such as TCP/IP multiplayer support. A sequel, Dungeon Keeper 2 was released in 1999, and the series was rebooted by Mythic Entertainment with the release of a remake (also titled Dungeon Keeper) for iOS and Android on 30 January 2014. Dungeon Keeper was released in Japan as Dungeon Keeper Premium,[lower-alpha 1] under the EA Best Selection brand, and re-released into digital distribution on gog.com on June 2011. The game was available there free of charge for a few days in February 2014. In October 2016, Dungeon Keeper was released free of charge on Origin, via its "On The House" programme. Dungeon Keeper received critical acclaim. The gameplay and uniqueness were its most heavily complimented aspects. Computer Gaming World praised the multiplayer mode, saying that it "promises to be extraordinarily rich and subtle", and concluded that it was "The most unique game in years; stylish, multifaceted, and as deep as the pits of hell". Game Revolution complimented the "terrific" graphics and the "nearly as impressive" sound, and concluded that 'Dungeon Keeper is a revolutionary, terrific game". Gamezilla called the game a "classic" and concluded, "Any real-time gamer with a yearning for the dungeon life and the nerve to slaughter an army of Monks, Fairies and Lords will be pleasantly surprised with Dungeon Keeper". PC Gamer UK praised Bullfrog's "amazing attention to detail" and the depth, and described the game as "A stunning achievement". Dungeon Keeper was named as their June 1997 Game Of The Month. In a 2001 review, PC Zone called the game "classic", but criticised its "repetitive" gameplay. GameSpot remarked "It's a rich strategy game that is both intuitive and challenging, both innovative and polished", and said the game was "among the best games released so far this year". Edge complimented the presentation, detail, and depth, and described the game as a "masterpiece". Computer and Video Games praised the flexibility and detail, and described the game as "totally awesome!". Jeuxvideo.com commended the replayability and sound effects. Robert Mayer of Computer Games Strategy Plus complimented the humour, sound, and the 3D view, and remarked that all elements work together, but criticised the artificial intelligence of the computer players. Dungeon Keeper was a finalist in the Software Publishers Association's 13th Annual Excellence in Software Awards Best of 1997 Codie awards for Best Strategy Software Game. In 1997, Dungeon Keeper appeared #4 on PC Gamer's list of top 100 games. ↑ "Dungeon Keeper on PC". GameSpot.com. Archived from the original on 22 January 2009. Retrieved 14 February 2008. ↑ Dungeon Keeper Premium Guide Book, pp. 2–14. ↑ Rick Lane (14 February 2016). "Remember when Dungeon Keeper was good?". Eurogamer. Retrieved 31 October 2016. ↑ "Cheap As Chips: Dungeon Keeper". Retro Gamer. No. 104. Bournemouth: Imagine Publishing. p. 30. ISSN 1742-3155. 1 2 3 Meer, Alec (7 August 2010). "Why Dungeon Keeper has never been beaten". PC Gamer. Retrieved 16 May 2016. ↑ Official Guide Book, p. 92. ↑ Dungeon Keeper Premium Guide Book, pp.22–24. 1 2 3 Manual, p. 25. ↑ Dungeon Keeper Premium Guide Book, pp. 37–41. ↑ Official Guide Book, pp. 13,20,116,117. ↑ Official Guide Book, pp. 129–133. ↑ Dungeon Keeper Premium Guide Book, p. 24. ↑ Official Guide Book, pp. 53,67. ↑ Official Guide Book, p. 37. ↑ Official Guide Book, pp. 43–75. ↑ Official Guide Book, pp. 119–124. ↑ Official Guide Book, pp. 32–34,42–89. ↑ Official Guide Book, p. 95. ↑ Official Guide Book, pp. 92,94. 1 2 Dungeon Keeper Premium Guide Book, p. 46. ↑ Official Guide Book, pp. 144–221. ↑ Official Guide Book, pp. 138,139,222–232. ↑ Dungeon Keeper Premium Guide Book, pp. 42–44. ↑ Dungeon Keeper Premium Guide Book, p. 43. ↑ "The best releases of the last two months...". PC Gamer. Vol. 1 no. 7. Bath: Future plc. June 1994. p. 25. ISSN 1470-1693. ↑ Dungeon Keeper Premium Guide Book, p. 44. ↑ Official Guide Book, pp. 89,214–221. 1 2 Dungeon Keeper Premium Guide Book, p. 94. 1 2 3 Lombardi, Chris (October 1997). "Dungeon Keeper: it Brings Bad Things to Life" (PDF). Computer Gaming World. No. 159. p. 261. ISSN 0744-6667. Retrieved 13 May 2016. ↑ Official Guide Book, pp. 234–249. 1 2 Official Guide Book, p. 252. 1 2 3 Official Guide Book, p. 253. 1 2 3 4 Official Guide Book, p. 264. 1 2 3 4 5 6 "The Making Of: Dungeon Keeper". Retro Gamer. No. 143. Bournemouth: Imagine Publishing. pp. 64–69. ISSN 1742-3155. 1 2 "Elf Destruction". Bullfrog Bulletin. No. 2. Bullfrog Productions. 1996. pp. 4–6. ↑ Official Guide Book, p. 259. 1 2 3 "Dungeon Keeper". Computer and Video Games. No. 188. Peterborough: EMAP. July 1997. pp. 70–73. ISSN 0261-3697. 1 2 3 Robert Mayer (1997). "Dungeon Keeper". Computer Games Strategy Plus. Computer Games Strategy Plus. Archived from the original on 10 July 2003. Retrieved 20 November 2016. ↑ "Killer Bullfrogs Launch Game" (PDF). News. Mean Machines Sega. No. 36. Peterborough: EMAP. October 1995. p. 12. ISSN 0967-9014. Retrieved 21 October 2016. ↑ Official Guide Book, p. 254. ↑ Dungeon Keeper Interview: Richard Ridings. EA Mobile Games. 5 February 2014. Retrieved 16 May 2015 – via Youtube. 1 2 "Revisiting Bullfrog: 25 Years On". Retro Gamer. No. 110. Bournemouth: Imagine Publishing. December 2012. pp. 60–67. ISSN 1742-3155. ↑ "The Making of Theme Hospital". Retro Gamer. No. 130. Bournemouth: Imagine Publishing. June 2014. pp. 46–51. ISSN 1742-3155. ↑ Ron Dulin. "GameSpot Presents Legends Of Game Design: Peter Molyneux". GameSpot. GameSpot. pp. 11, 12. Archived from the original on 1 September 2003. Retrieved 5 November 2016. 1 2 "The Making of Dungeon Keeper". NowGamer. 17 April 2009. Retrieved 17 November 2016. 1 2 "Welcome to the House of Molyneux". PC Gamer UK. No. 44. Future Publishing. June 1997. pp. 74, 75. ISSN 1470-1693. ↑ "Born-Again Keeper". Bullfrog Bulletin. No. 4. Bullfrog Productions. 1997. pp. 8,9. ↑ Molyneux, Peter (13 June 2001). "Postmortem: Lionhead Studios' Black & White". Gamasutra. Retrieved 31 October 2016. ↑ "An Audience With Peter Molyneux". audience. Edge. No. 47. Bath: Future plc. July 1997. pp. 22–27. ISSN 1350-1593. ↑ "Dungeon Keeper Soundfont Technology In Action". Creative Technology. Archived from the original on 9 October 1997. Retrieved 13 May 2016. 1 2 "How to Create a Dungeon Keeper Soundfont Bank". Creative Technology. Archived from the original on 9 October 1997. Retrieved 13 May 2016. ↑ "Dungeon Keeper Download a Soundfont Bank". Creative Technology. Archived from the original on 9 October 1997. Retrieved 13 May 2016. ↑ "Dungeon Keeper: The Deeper Dungeons on PC". GameSpot.com. Archived from the original on 10 October 2007. Retrieved 14 February 2008. ↑ Jason Ocampo (1997). "Delve deeper into Dungeon Keeper". Computer Games Strategy Plus. Computer Games Strategy Plus. Archived from the original on 23 May 2003. Retrieved 20 November 2016. ↑ Dungeon Keeper Premium Guide Book, p. 120. ↑ Jason Ocampo (27 April 1998). "Dungeon Keeper Gold Edition". Computer Games Strategy Plus. Computer Games Strategy Plus. Archived from the original on 10 July 2003. Retrieved 20 November 2016. ↑ Meer, Alec (28 September 2010). "A Deeper Dungeon: Dungeon KeeperFX". Rock Paper Shotgun. Retrieved 16 May 2016. ↑ "KeeperFX Readme file". DK Maps'n'Tools Base. Retrieved 16 May 2016. ↑ "Dungeon Keeper II - PC". IGN. Retrieved 20 November 2016. ↑ "Dungeon Keeper Out Now On Android And iOS". Retro Gamer. 30 January 2014. Retrieved 20 November 2016. ↑ "Dungeon Keeper". Electronic Arts Japan (in Japanese). Archived from the original on 20 February 1999. Retrieved 13 May 2016. ↑ Walker, John (3 June 2011). "Good Old Games Add Good Old EA Games". Rock, Paper, Shotgun. Retrieved 19 December 2015. ↑ Grayson, Nathan (15 February 2014). "Apologies With A Capital EA: Dungeon Keeper Free On GOG". Rock Paper Shotgun. Retrieved 14 May 2016. ↑ Adam Smith (7 October 2016). "Keep Forever: Dungeon Keeper Is Free Right Now". Rock, Paper, Shotgun. Retrieved 31 October 2016. ↑ "Original Dungeon Keeper now free on Origin". Complete Game Reviews. 7 October 2016. Retrieved 31 October 2016. 1 2 "Dungeon Keeper". Testscreen. Edge. No. 46. Bath: Future plc. June 1997. pp. 82, 83. ISSN 1350-1593. 1 2 Ward, Trent (7 September 1997). "Dungeon Keeper Review for PC". GameSpot. Archived from the original on 6 December 2003. Retrieved 16 May 2016. 1 2 Flynn, James (June 1997). "Dungeon Keeper". PC Gamer. No. 44. Bath: Future plc. pp. 70–73. ISSN 1470-1693. 1 2 "Dungeon Keeper review". Game Revolution. 7 May 1997. Retrieved 13 May 2016. 1 2 McDonald, Chris. "Dungeon Keeper by Bullfrog". Gamezilla. Archived from the original on 8 February 2002. Retrieved 13 May 2016. 1 2 "PC Review: Dungeon Keeper". Computer and Video Games. 13 August 2001. Archived from the original on 14 July 2007. Retrieved 15 May 2016. 1 2 "Test : Dungeon Keeper". Jeuxvideo.com (in French). 1 September 2009. Retrieved 31 October 2016. ↑ "Software Industry Unites in Celebration for 1998 Codie Awards". SuperKids. Software Publishers Association. 23 March 1998. Retrieved 17 May 2016. ↑ "The PC Gamer Top 100". PC Gamer. No. 45. Bath: Future plc. July 1997. p. 73. ISSN 1470-1693. Melissa Tyler; Shin Kanaoya. Bullfrog's Official Guide to Dungeon Keeper. ISBN 978-0-7615-0714-7. ダンジョンキーパープレミアム勇者撃退ガイド Danjon Kīpā Puremiamu Yūsha Gekitai Gaido [Dungeon Keeper Premium Hero Repel Guide] (in Japanese). Tokyo: NTT Publishing. 1998. ISBN 978-4-87188-897-4. Dungeon Keeper manual. Bullfrog. 1997.